It is a great honor to focus the “Seasoned Saint Spotlight” on the ‘FBBC ICON’ – First Deacon Henry Hopson Jr.; born and raised in Donalsonville, GA.; married to Brenda (Banks) Hopson for 36 years. They are the parents of two children-the late Henecia (Nece) Hopson and Henry (Trae) III, and one grandchild-Melaysia. His hobbies are playing golf, reading and writing. Henry’s career began as a senior contract price analyst at Robins Air Force Base. Henry’s strong desire to own his own business motivated him to leave Robins and pursue a career with State Farm Insurance Co. 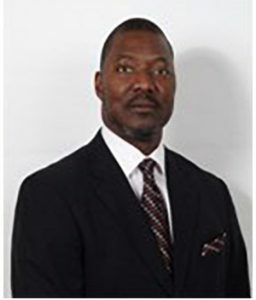 He is currently the owner/insurance agent at Henry Hopson Agency-State Farm Insurance Company. Henry believes that his two career paths served to reinforce what he was taught as a youth. He states, “I did not understand my parents during my early years but my parents and grandparents taught me honesty, humility, and respect for all people—regardless of race or income. On a daily basis, my career has given me the opportunity to validate the wisdom of what I was taught and mold me into who I am today.” Henry has been a member of Fellow-ship for 34 years. He was ordained as the first deacon; served as a part of the Deacon ministry since being ordained; is a CE teacher, served as a part of the evangelism and comforters’ ministries and Board of Trustees. Henry stated that the most important lesson learned: -“Think before you speak because the things you say and the way you say them impact the world and last beyond our lifetime.” Henry would like to be remembered as a Teacher of God’s word. His message for Generations X.Y and Z: “Continue to be a student of God’s Word. Teach it to your children and instill it in them to teach it to their children. The business of life, as you know it, will continue to change. You will never be able to keep up. You/we are on a sinking ship but the Word of God is our life raft. The FBBC’s ICON’s Special Scripture is: Romans 12:1-2.